The Boycott, Divestment and Sanctions (BDS) movement is shattering Israel’s illusion of invulnerability. The “delegitimisation” movement, as Prime Minister Benjamin Netanyahu deﬁnes it, is building consensus among international actors and Israeli Jews themselves, in deﬁance of the Anti-boycott law. change in Israel’s public image that is stirring anxiety in the political establishment. The piece, which can be seen in full here, concludes with powerful arguments from Omar Barghouti of the Palestinian BDS National Committee and Ronnie Barkan of the Israeli group Boycott from Within. The BDS “is not a one-size-ﬁts-all recipe”, says Barghouti. Every international partner is free to decide whether to boycott Israeli companies as a whole or only those involved in the oPt. But “no one called for boycotting only Sudanese factories in Darfur due to Sudan’s massive violation of international law there. Only when it comes to Israel do we hear this strange distinction and we are asked to ﬁght the crime, not the criminal who committed it”. 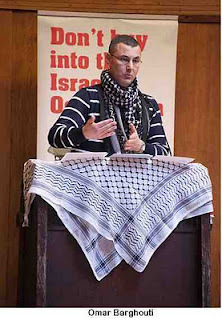 Barghouti strongly believes the EU has to take four immediate measures to restore its credibility among the disillusioned Arab and Palestinian civil society: Firstly, impose a military embargo on Israel and the entire region as a “conﬂict zone”; secondly, ban imports from all Israeli companies that proﬁt from the occupation; thirdly, stop funding Israeli universities and research institutes involved in violations of international law; and instruct European companies to stop their involvement in Israeli violations of international law, including occupied Jerusalem. The Israeli BDS wing Boycott from Within, advocates a global boycott of Israel. The ultimate aim is equality, which according to Ronnie Barkan is “regarded by Zionists as the destruction of the state of Israel. What the BDS movement calls for is the dismantlement of its system of segregation, just as South Africa was not destroyed by ending apartheid”.